It’s even more nail polish and the like, because let’s face it… I’m in love with my manicures! My crap nails just do so much better when I keep them manicured. 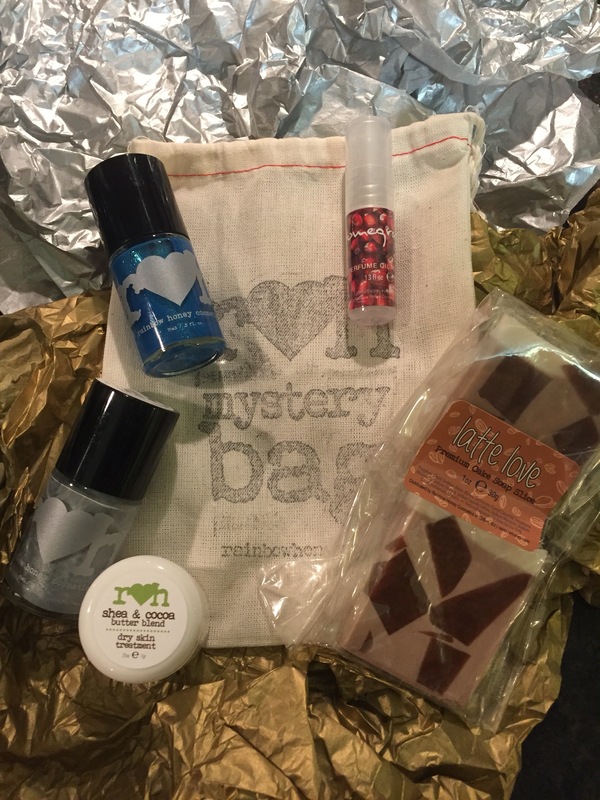 I cannot say enough good things about the fun that is the Mystery Bag. Rainbow Honey often has previous months’ bags up for grabs, so it is always worth checking out! Smokey Creme Nail Lacquer: this is really a smokey grey and gorgeous. It will match winter! Perhaps I will use it for the first snowfall of the year? I feel like this will be a staple colour in my collection! Majestic Bluewhale Nail Lacquer: this is such a gorgeous and bright blue. I really dig blue polishes, so I’m looking for a special occasion to use this. Organic Shea and Cocoa Butter Skin Treatment: I live for Shea butter. That stuff is like the awesome and makes my skin so much better! Also, it’s great for my hair. The deets say its good for those horrible and scaly places like our knees and elbows and heels! It’s winter so just about anything has to help, right? I see a recommendation to try it with your fave gloves and socks for extra moisturizing. Latte Love Premium Cake Soap Sices: this is ok. The scent is a wee bit too coffee like for me, and I’m the weird one that doesn’t like the smell of coffee. Like I totes avoid that aisle at the market. And I 💜💜💜 Starbucks, so imagine my pain now. I’m really looking forward to some additional spa days… Sweet deal with the December perks! What would you like to see? Make sure you follow me on Instagram to see my manicures! It’s absolutely awesome! I believe I posted a picture with it on my Instagram.